Today we revisit one of our favorite places in the state, PA Elk Country in the PA Great Outdoors Region around Benezette, PA. 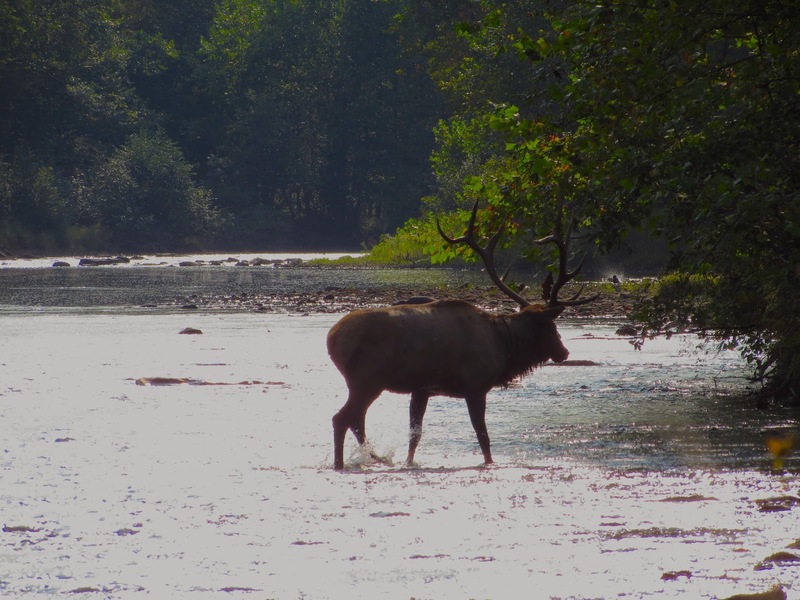 Majestic Elk roam free in this outdoor wonderland as they once did throughout the state. For more information and background on the region, check out our previous articles on the Elk Country Visitors Center at Winslow Hill and the Elk Scenic Drive. Once extinct in Pennsylvania, an amazing conservation effort happened in the days of Teddy Roosevelt to reintroduce this species to the region. The end result is an area that has a herd of Elk that rivals that of the elk and bison at Yellowstone National Park, the moose at Denali National Park, and others. This is an experience that you do not get anywhere else in Pennsylvania. We first stopped to get an early fall view of the Marion Brooks Natural Area to get a glimpse of this spectacular grove of birches as they transition into autumn. These birches are absolutely captivating and would be worth a visit alone, even without the elk in the region. 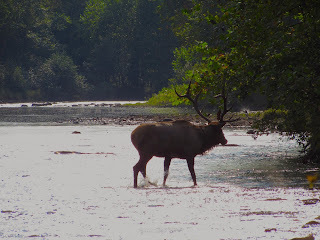 Since the elk are generally out early and late in the day, on this afternoon we took a little drive out through Cameron and Clinton Counties along the Sinnemahoning Creek to beautiful Renovo, home to the PA Flaming Foliage Festival in October. We spotted this Norfolk Southern Train on the old Philadelphia and Erie Railroad, which was created to connect the two corners of the state by rail during the oil boom in northwest PA.
We are now heading back to the Benezette area and are stopping at each of the wildlife viewing areas. There are a number of them, and seem to be more each time we visit. Even if you miss elk at them, they are certainly beautiful to see. There are also a number of natural areas with older growth and thick forests, including this view from the Jerry Run Natural Area near Driftwood. We caught these guys crossing the Sinnemahoning Creek. Little did we know that this was one of the smaller bull elk we would see that day. He had a pack of about six or seven elk total. Mid bugle! We heard him bugle a few times. It is a spectacular and shrill sound that you will hear many times throughout the fall breeding season. During this time of year, you will often catch them locking antlers and fighting for a mate, a spectacular thing to see. The last of the group crossing the creek. And into the woods they go! Winslow Hill is a spectacular overlook at any point, even if no elk are out yet. At this point in the afternoon, the elk had not made their way out of the woods quite yet, except for this one, which was out doing a little sunning. As we head further down Winslow Hill Road, we see more elk making their way out. We stopped at the relatively new, Woodring Farm Area, which has ample parking and a 3/4 mile nature walk right into the habitat of the elk. The area is situated above a huge valley, providing one of the finest vistas in the region. There is just a short walk up this hill, to get up to the plateau area that the property is located at. Thanks to the nice little walk, you are given ample room to sightsee in an intimate and quiet setting. The old farm is filled with pine forests and old fields that have responsibly been reclaimed by the DCNR and converted into a variety of habitats. This land was cultivated as a farm until relatively recently, and the DCNR smartly purchased the land and made it an area for open elk viewing. The scenic vista here is beautiful, and the valley is often filled with elk. We ran into these two elk roaming the fields in this quiet setting. We watched them for at least twenty minutes, and only two other people had come around in the time that we were there. The Woodring Farm area is an excellent place to appreciate the beauty of these majestic creatures. Notice the small Antlers growing on this young yearling bull elk. We watched these guys as the sunset was happening, and it was simply beautiful. Now we head to the Dent's Run overlook. This bull elk was resting within view, seemingly situated to take in this beautiful sunset. We decided to double back to the Winslow Hill Overlook, and caught the tail end of a fight between two bull elk, and the sight of dozens of elk at dusk. This giant bull elk was in exile. This is the second time that we have been able to visit the elk during the fall, and we highly recommend it. There is nothing like watching these giant creatures graze. It is refreshing and inspiring to see, and reminiscent of watching the elk and bison roam free throughout Yellowstone National Park, in addition to the moose at Denali. We highly recommend spending some time up there during any season of the year, but the fall is simply incredible. For more information and things to do in the region, check out our list and the website for the PA Great Outdoors Region. 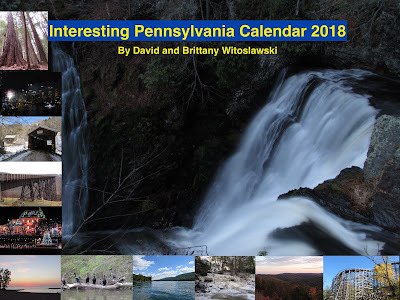 Be sure to check out our 2018 Pennsylvania Wall Calendar, available through the dropdown menu at the top of the page. For more information, check out this link. Thank you for helping support Interesting Pennsylvania and Beyond! Today we visit the pretty East Park in Connellsville, home to a lovely area of relaxation along Connell Run. The park has picnic groves, playgrounds, and, the main draw for me, a set of waterfalls. East Park Falls consists of an upper and lower section that is easily accessible. They are both no more than ten feet tall, though upper and lower and gorgeous within this heavily wooded gorge. The region is home to a number of waterfalls, including nearby Robinson Falls, and the many falls of Ohiopyle State Park, located relatively close by. The falls of East Park and Robinson Falls are worth a stop if you are in the area. Notice the rock wall in the background. It appears that there was once a mill located in this location. The hydro power of this region was being heavily utilized at the dawn of the Industrial Revolution. These mills were utilized for many things, including grist mills for the creation of flour, and saw mills to cut fresh timber. Some of the mill buildings remain in the area, but the machinery from one of the mills is on display at the State Museum of Pennsylvania in Harrisburg. Looking down into the gorge that is home to East Park. East Park itself is an awesome place to relax for a while and perhaps have a picnic lunch at. It is nicer than your average community park, with its location in a nicely wooded gorge. If you are in this area of the Laurel Highlands, be sure to stop by and check it out.